Sapindaceae is a large plant family that includes many common and economically important genera and species, including maple trees, rambutan, longan and lychee. Lychee fruit comes from the Litchi chinensis tree and is in the monotypic genus Litchi, meaning it is the only species in the genus. Despite this, it is very similar in appearance to its relatives, the rambutan and longan. The lychee comes from China where it is a well-liked fruit and for the most part commercial cultivation is limited to south east Asia. The lychee tree can grow quite tall, and yields large bunches of bright (reddish) colored fruits. Lychee trees can be grown in tropical and sub-tropical climates, requiring warm and wet summers as well as mild winters. Although they can handle short periods of frost, they are rather sensitive. Despite this they have been cultivated in many parts of the world including in the lower states of the U.S.
Lychee fruit can be purchased easily during the correct season (May - July) and often at a reasonable price. The fruits have three main components, a thin tough rind, thick sugary flesh and a hard dark seed. The flesh is delicious fresh, it is juicy with a somewhat floral flavor, and is stored well in the freezer for later use. Lychee seeds are quite easy to germinate through a variety of methods. Choose seeds that are from freshly eaten fruit, as they will have a much higher germination rate. Be sure to clean off any excess fruit from the seeds. Firstly, the seeds should be soaked in water for about three days, each day the water should be changed. You will notice that the dark shell of the seed will begin to split, this is when you may begin the next step of germination. I have tested germination directly in soil and using a wet paper towel in a plastic bag and they are both comparable. So follow the method that is easiest for you. The seeds should be planted in well draining potting soil, ideally one with vermiculite and perlite, but most commercial potting soils will do just fine. Plant at a depth of about 3/4 inches. Lychee seedlings may be grown inside near a window that receives a lot of natural light, or alternatively they can be planted in pots and kept outside until winter. Of course, lychees will do much better in sub-tropical and tropical climates, they can also be brought to flower and fruit in greenhouses. Avoid fertilizing lychee seedlings for the first year, and only light applications until growth becomes large and woody. Upon germinating, the lychee seed will provide the necessary nutrients to support the growth of a main root and shoot. As the shoot emerges from the soil the cotyledons will begin to develop. Initially the leaves will be slightly discolored, often yellow or purplish, but as the leaves begin to generate chlorophyll the leaves will turn a dark green. At this point the seedling is capable of conducting photosynthesis and true leaf growth will begin. Phoenix is a genus in the family Arecaceae which is composed of about a dozen species. The most economically important of which is Phoenix dactylifera, the true date palm. Fruits of the date palm contain very high sugar content and are prized for the energy they provide. Date palms generally require very warm and sunny summers with mild winters, typical of many regions of the Middle East. Dates are commercially cultivated in the Middle East, parts of Africa, many islands and subtropical locations, but also in the United States. Dates are cultivated commercially in many states including California and Arizona. In order to ensure successful harvests, dates must be grown in arid regions that have hot summer temperatures and only mild freezes in the winter months. On top of that, fruit production requires a lot of water, despite the fact that dates can withstand long droughts. Date trees are versatile, serving as much more than a shade tree that provides fruit. Sap can be tapped from the trees, which can then be used as a sweetening syrup or fermented into an alcoholic drink. The leaves are used for a variety of purposes such as roofing for houses, and crafts such as baskets. Seeds can even be used as a feed-stock for animals. There are over one hundred cultivars of dates grown around the world and the differences between them can be quite stark. For instance, the Deglet Noor date is generally light in color with firm flesh where as Medjool dates have a dark color with thick and soft flesh. Some dates are small, some large, while others are moist with sugars and syrup others can be dry to the touch. Quite possibly my favorite dates are the Jumbo Medjool dates which are especially large compared to typical Medjool or Deglet Noor dates. This method is quite easy but actually yielding fruit from your trees will be a bit more challenging. To grow a date palm simply eat a date, remove the seed and wash it clean of any excess flesh. Next soak the seeds in water for at least 24 hours (or 48 hours), which will allow the strong seed coat of the date seeds to imbibe water. There are many methods for germinating date seeds, but there are two easy methods for most date seeds. The first is to sow the date seed (rough side down) about 1" into a small pot filled with soil. Lightly water the soil occasionally ensuring moisture at the seed's depth, while being careful not to over-water the soil. The second method is to wrap the date seeds in a slightly moist paper towel and put them in a plastic bag. Place the bagged seeds in a warm place, at least 75°F and small white roots will begin to appear from one side of the date seeds. The germinated seeds may then be planted in a small or medium sized pot filled with a palm or cactus potting soil. Date seeds are really picky when it comes to moisture, they want to be only slightly moist so be sure not to over water the seeds. Other germination methods work better for tricky seeds, and these include the incorporation of sand and vermiculite to help regulate the moisture of the soil. Palm or cactus potting soil mixes are a good choice for planting date palms in, and they are usually available at home and garden stores. Alternatively you may add sand and/or vermiculite to a generic potting soil (in a 1:4 or 1:3 ratio) to provide good aeration and drainage. Adding peat moss to the soil will help the soil retain moisture if it is draining too well. Most palm or cactus potting soils have a good mixture of sand, vermiculite, perlite and peat moss and will be the most suitable for date palms. Once you have a date palm seedling established, you must cater to its growth by transplanting it gradually to larger and larger pots. Transplant your date palm when you notice that it is outgrowing its container or growing roots out from under the container. Be sure to water the palm well before and after transplanting and avoid transplanting into a significantly larger pot. Alternatively the palm may be transplanted into the ground if your climate supports its growth. Otherwise date palms may be kept in large pots outdoors, on a porch or somewhere receiving maximum sunlight. It may be possible to keep date palms indoors near a window that receives direct sunlight, although its growth will likely be severely hindered. Date palms are dioecious, meaning that each plant is either male or female. Females are more desired because they will bear fruit, while the males only provide the pollen to fertilize the females. This means that only one male plant is needed to pollinate many females. The pollen grains of date palms are small and can easily travel by wind to pollinate the females, but commercially it is hand pollination that is the method of choice to ensure maximum fertilization. Growing date palms by seeds results in plants that are not true-to-type, meaning the seedlings will develop into palms with fruits that may be smaller and of lesser quality than the parent. 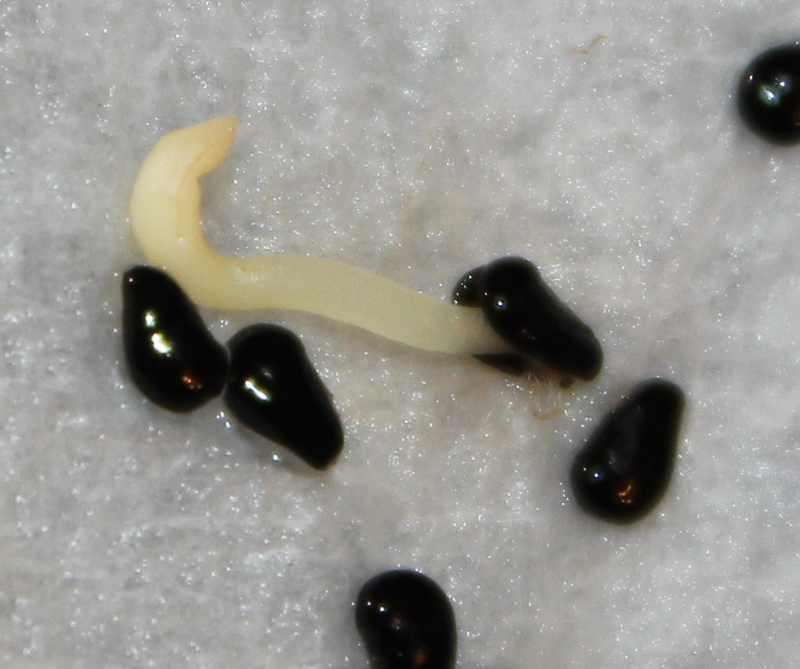 On top of this, only about half of the seeds that germinate will be the desired females. Therefore vegetative propagation is the preferred method of many commercial farms and nurseries. This can be done through tissue culture in a laboratory setting or by offshoot rooting of young date palms. Young date palms, about ten years of age, will begin to send offshoots from the basal portions of the trunk. These offshoots are directly connected to the parent plant, and thus receive all of their nutrients and water from the parent. Overtime they will develop roots that will bury into the soil to support their independent growth. This may be facilitated by building soil up around the offshoot if it appears close to the parent trunk. Over time these may be severed from the parent plant and potted in a process that should only be done by experts to ensure success. Although this is a long and time consuming method of propagation, it results in true-to-type clones of a female plant that will have a head start over date palms started by seed. Above are ripe fruits of the Silver Date Palm (Phoenix sylvestris) which is a date palm with a sweet sap that is used to make palm wine. The fruits are edible but have only a small layer of flesh, though I find them to be delicious. This is an inexpensive box of Iranian dates the cultivar of which I do not know. There is a huge difference between these low quality dates and those that fetch over a fifty dollars a kilogram. I found these dates to have a soggy texture and a thick outer skin. A closeup of this date palm (Phoenix dactylifera) shows mature offshoots that were allowed to grow, and the many small knobs from offshoots that were cut back long ago. Notice the roots that emerged from the old offshoots. Jackfruit trees yield the largest fruits of all fruit trees, with some weighing well over 50 lbs. This truly massive tree belongs to the mulberry family (Moraceae) and is known taxinomically as Artocarpus heterophyllus. It is closely related to but not to be confused with the breadfruit (Artocarpus altilis) which similar to jackfruit has a very sticky latex that exudes from severed leaves, stems and fruits. Unfortunately, jackfruit tree cultivation is pretty much limited to the tropics as the young trees are sensitive to freezing temperatures. Aside from cultivation in Hawaii or certain regions of Florida, yielding fruit from one of these trees outside of an enormous greenhouse would be nearly impossible. Regardless, jackfruit trees may be grown to a limited size within a normal greenhouse or even in some cases indoors given adequate light. To grow a jackfruit you must obtain some seeds, and search no further than a fresh jackfruit. To eat a jackfruit, first you must be sure that it is ripe. Jackfruits are typically sold immature, and unripe, these will be green and firm. As the fruit ripens dark patches and yellow color emerge, along with a very distinct and strong fruity smell. Additionally the skin of the fruit should give in slightly to pressure, indicating that the fruit is ready to be cut. To accelerate the ripening process, jackfruit may be placed outside in warm sunlight for a few hours or more. To slow the ripening process, jackfruit may be stored in the refrigerator. Before cutting into a jackfruit, be aware of the powerful latex that resides within the fruit. If this latex gets on skin, soap and water will prove ineffective to clean it off. Instead, keep some cooking oil handy as the latex is easily removed with oils. Furthermore latex or nitrile gloves should be used to protect ones hands against the sticky latex. A long knife should be used to cut the fruit down the middle, be sure to apply a generous amount of oil on the knife before cutting the fruit to prevent the latex from adhering to the blade. Pictured above is a ripe jackfruit with some slight yellow tinges and brown and black spots visible. Compare this to the unripe jackfruits pictured at the top of the page. Cut the jackfruit longways with a large knife to expose the midrib and surrounding fruits. Carefully use a smaller knife to cut out the midrib from the rest of the fruit, as shown above. Now it is possible to easily remove the yellow fruit pods from the stringy white filaments. Finally, the seeds should be removed from the fruit pods so that the fruit may be eaten, cooked or blended in smoothies. The yellow flesh of a ripe jackfruit will taste like some kind of combination of banana, mango and pineapple. Don't discard the seeds as they may also be cooked and eaten, or planted to become new jackfruit trees. The yellow fruit pods of a jackfruit should be stored in airtight bags or containers for only a couple of days in the refrigerator. Since it's quite difficult to eat an entire jackfruit in a timely manner, I prefer to store the bulk of my jackfruit flesh in the freezer for long-term storage and for use in smoothies. The seeds from jackfruit are large and full of energy for the developing seedling. This means that whatever method you choose to grow your jackfruit you will inevitably end up with a large and healthy seedling. One of the most important factors is planting fresh seeds, as older seeds become more dry their chances of germination dramatically decrease. To ensure success, simply place a jackfruit seed about 1 inch into well draining potting soil. The seeds may even be placed in a cup of water placed on a window sill, and eventually small roots and a stem will emerge indicating that it is time to transfer the germinated seed into soil. The seeds should germinate in about a month, but this will vary depending on climate and the freshness of the seeds. Upon germination the young jackfruit seedling will grow rather quickly. The first few leaves will appear and enlarge in about a week. Within a few months the stem will thicken and more leaves will appear. Avoid fertilizing jackfruit seedlings for the first year or two and be sure that the soil is draining well as waterlogged soil is lethal. Jackfruit seedlings utilize the energy held within the endosperm of their large seeds to grow a thick and long tap root and send up a shoot with developing leaves. The leaves develop rapidly so that the plant may begin to photosynthesize and provide the energy required to sustain its growth. I like boiled jackfruit seeds, although they are also good roasted and in stir-fry. To boil jackfruit seeds bring a pot of water to boil (4 cups water per 100 seeds should do) and add a teaspoon of salt. Throw in the jackfruit seeds and let them boil for about 10 minutes and turn off the heat, letting the seeds steep in the hot water for about 5-10 minutes longer. The result is a starchy, soft textured seed with a mild flavor. A cooked jackfruit seed should be peeled of the outer casing before eating. Believe it or not, jackfruit trees are used for much more than their delicious and nutritious fruit and seeds. The latex is often used as a glue, while the wood is highly coveted for building furniture and houses. In many regions of the world this is a sort of miracle tree that provides shade, fruit, latex and wood. I recently set up a poll to gauge my readers' interest in the next propagation guide, but unfortunately there was a problem and it got reset. Last time I checked though it was neck-and-neck across the board so I'll just pick this time. If you have a particular interest in a tropical plant that I haven't covered please e-mail me and I'll see what I can do. My curiosity in bananas has evolved throughout my life. It all started as a child when I wondered where bananas come from, since I had never seen a banana tree before. As I grew I discovered that banana trees aren't really trees in the traditional sense of the word, but instead very large 'herbs'. And now I know that bananas are much more than the ubiquitous yellow fruit found in grocery stores around the world. Bananas come from the diverse and intriguing genus Musa which comprises several dozen accepted species in addition to many hybrids. The single most successful banana hybrid is the Cavendish banana which has a fascinating and unfortunate history. The Cavendish banana is essentially every common banana found in the grocery stores (except maybe specialty grocers), it is the curved yellow fruit that everyone is all too familiar with. What may be less known is that the Cavendish bananas are sterile due to a genomic condition called triploidy, meaning that they contain a whole genome plus a partial set of a genome from the parent species Musa acuminata. One might ask, how are there so many bananas and how are they grown if none of them have seeds? This is achieved on a commercial scale using tissue propagation, which is essentially a process of cloning. However, there are many delicious seeded bananas that the average horticulturalist may grow quite easily. Thus the subject of this article arises: How to propagate bananas. Banana trees are extremely fast growing, they are capable of going from seed to fruit in only a few years. These plants are most often tropical, desiring warm and humid climates, with a few exceptions. They grow best in full sun and in fertile and moist soil. Banana trees grow tall, with some reaching well over 20 feet tall. However, not all banana trees are created equal, they vary in size and shape and while some have green and yellow fruit, others have red or even pink fruit. There's a very good reason that bananas aren't grown in most of the United States, and it's the freezing winter temperatures. Even a slight freeze (or general cold) is enough to kill a Cavendish banana tree, however there are ways to work around this. I have been able to grow dwarf banana trees in my greenhouse with few problems, they even go to fruit rather quickly. Supposing one is growing a dwarf banana variety, it is possible to cultivate it in a pot, leave it outside in the sun during summer and bring it inside for the winter. This will sap its growth and you may not get much of a harvest, but it's certainly worth the novelty factor. Furthermore, there are some banana species that can be grown in cold and occasional freezing temperatures, with the best example being the Japanese Fiber Banana, Musa basjoo, which although is inedible, can make for a great landscape ornamental. What's the big deal? Bananas are inexpensive anyways - Right, well I have developed a keen interest in fruit diversity, and I'm happy to say that bananas are quite diverse. This is largely due to the compatibility of closely related Musa genomes, which in some cases allows different species to cross and form some very unique hybrids. There are countless banana species and hybrids with varying ploidy levels (i.e. varying genome size and composition) which yield fruits of varying sizes, shapes, colors and tastes. In fact, just as there's a wide selection of apple fruits, so too is there of bananas, so why can't we buy them at grocery stores? This is for two reasons, one being lack of customer awareness, and the second being that the Cavendish banana currently seems to be the easiest to grow on a commercial level. So if you're curious about the other flavors that exist in bananas, you can always purchase some exotic cultivar banana seeds from the internet and grow them yourself. This is essentially the only option for most first-time banana growers, and it's pretty straightforward and easy. The first step is to find some banana seeds, but don't settle on just any banana seeds, find a cultivar or variety that interests you and suits your location. Two easy to find banana seed types that are perfect for beginners are those of the dwarf Cavendish banana and pink banana. These are readily available on the internet and are relatively fuss-free for greenhouse cultivation. Once you have some banana seeds, be aware that germination may take a long time, at least a month but in some cases much longer, up to a year. The more fresh the seeds, the faster and more efficient germination will be. My method of choice for most tropical seeds is the moist paper towel or soil in a plastic bag. While this will work for banana seeds, to increase germination even further I will do a modified protocol. On the left are seeds from a dwarf Cavendish variety (Musa acuminata) and on the right are seeds from a pink banana (Musa velutina). Banana seeds may be scarified, this is the process of breaking the seed coat so as to increase germination. To do this simply take a knife and create a small notch or scratch on the hard outer seed coat, but be careful not to crack the seeds, as old seeds may be quite fragile. Now place the seeds in warm water for 24-48 hours to allow the seeds to imbibe water. Ideally the water should be warm (70°-85°F), so if your house is cold, simply place the water soaking seeds in the warmest place or utilize a seed germinating heat mat. Finally comes the long haul. For this I will use a tupperware container with some moist potting soil and I will gently sow the seeds about 1/8-1/4 of an inch down. Then I place the container on a warm and light window sill and begin the wait. Mist the soil as it becomes dry, but don't over water as the soil should never be wet. Be careful to not allow fungus to grow in the container, you may use a gardening fungicide if this becomes a problem. Alternatively, you may place the seeds in a bag containing moist soil or a moist paper towel and achieve similar results. After the banana seeds germinate and form roots and a visible stem, they may be transplanted to small pots. They will inevitably germinate at different times so be prepared to transplant them on an as needed basis. As the banana seedlings begin to grow you will need to scale up the size of pot that they are growing in, or eventually plant them directly in the ground. Commercially, bananas are propagated via tissue culture, resulting in clones of a single plant. Tissue culture is a powerful method of propagation, one that can yield nearly infinite replicates of a tried and true plant. In the case of bananas, a cluster of stem cells called the meristem is cut out of a banana tree and subsequently divided into many pieces. Each piece of the meristem can be grown in petri dishes containing nutrients and growth hormones. This stimulates the meristem to grow appropriate tissues such as roots and leaves. These clones may eventually be transferred to soil and grown into banana trees for the commercial industry. Therefore, each banana you buy from the store is likely genetically identical to the last bananas you purchased. Tissue culture is a tricky process, something that is seldom done outside of a laboratory setting as it requires sterile conditions and skilled hands. 'Pups' are the small plantlets that emerge from the base of a banana tree. Typically these are removed as the parent banana tree is growing so as to focus the plant's energy on growth and banana production. However once the banana harvest has developed, the pups may be left to grow. Upon harvest, it is possible to have many small banana plantlets at the base of the parent plant (which dies after harvest). Overtime these plantlets will grow into the next set of banana trees in a cycle that can perpetuate harvest after harvest. A dwarf Cavendish banana flower and immature bananas. A small harvest from the dwarf Cavendish banana tree grown in my greenhouse. The bananas were small but delicious, with the typical Cavendish flavor however the texture was a bit chewy. Banana cultivars from left to right: Cavendish, plantain, Saba, Burro, Chuoi su, Manzano. There is an array of bananas available at specialty grocers and Asian markets. One of my favorites is the baby banana type called Manzano, which is Spanish for apple tree. This small, sweet banana holds true to its name and tastes like a combination of apple and banana, they are very sweet with a smooth texture.